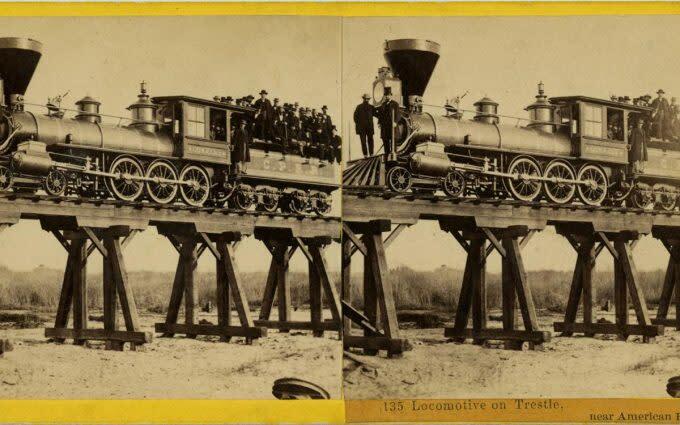 This major traveling exhibition celebrates the 150th anniversary of the “Meeting of the Rails” at Promontory Summit, Utah, on May 10, 1869, through the photographs and stereographs of Andrew Joseph Russell (1830–1902) and Alfred A. Hart (1816–1908). Drawn exclusively from the Union Pacific Historic Collection at the Union Pacific Railroad Museum, these images represent the largest collection in the world of original photographs documenting the construction of the transcontinental railroad between 1866 and 1869.The Race to Promontory features fifty framed Imperial plate albumen prints by Russell, including images from his album, The Great West Illustrated, as well as rare, unpublished prints from the Union Pacific Collection, including Russell’s famous image from Promontory Summit, East and West Shaking Hands. One hundred eight stereograph cards by Hart will be also be displayed, and two stereograph viewers will allow museum visitors to view Hart and Russell images in three dimensions. 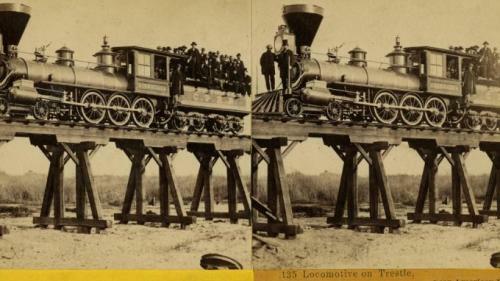 The exhibition will also include archival material from the Union Pacific Collection, commemorative objects relating to the events at Promontory Summit on May 10, 1869—including the original “Arizona Spike” from the celebration of the laying of the last rail—as well as artifacts and records from the construction of the railroad.The UMFA exhibition will also include a selection of works from nineteenth-century Utah photographer Charles Savage, who composed scenes of the railroad and local landscapes to boost tourism and settlement.